When you become engaged there are so many plans to be made. You are faced with so many choices like choosing a dress, location, a date and so much more. Then, you need to create a wedding registry so your guests have a clue as to what you want or need for your new household. 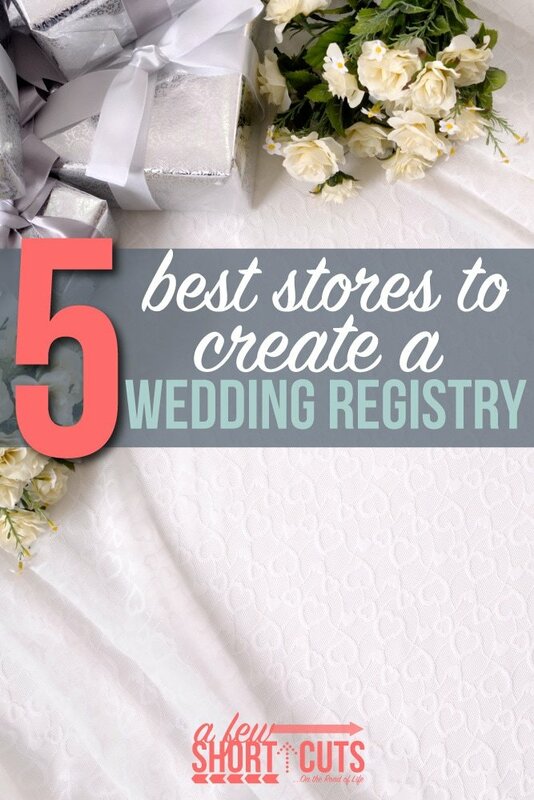 Here is a list of the 5 Best Stores to Create a Wedding Registry and why! FREE SHIPPING ON EVERYTHING: Every single gift on your registry, big or small, ships for free. GROUP GIFTING: Guests can contribute any amount they want toward the gift you want. 10% OFF: Save 10% on gifts you don’t receive on your big day. Who doesn’t love Target?! Again, target has the ability to register online! LOVE! Plus, check out this page of bonus gifts. Add specific items to your registry, if your guests purchase them for you, you get even more bonus gifts! Score! 15% off completion offer + coupons: after your event date, get a coupon for 15% off the items remaining on your registry, plus coupons for friends and family. Hassle-free returns. you have up to one year after your event date to return or exchange items from your registry. Access your registry on the go. create or manage your registry anytime, anywhere, with our Target Registry app for iOS and Android™. 10% Off Coupon: After the date of your event receive a one time use 10% off coupon on select items. Universal Registry: Add items from other websites to your Amazon Registry with a special downloadable tool. Bonus Gifts: Receive bonus gifts when you register for items from select vendors and your guests make a purchase. See the list. 20% off Invitations: Get 20% off Invitations from weddingpaperdivas.com. Kohl’s does not skimp in the Wedding Registry department. Why should your register at Kohls? Check out these perks. Kohl’s Ever After Rewards – Earn 10% rewards on gifts purchased from your registry. Gift Registry Catalog – Browse through pages full of ideas for the gifts you’ll really need (and want!). Announcement Cards – Send your guests a 20% off discount to use on your registry. Completion Program – Save an extra 15% on items left on your registry for three months after the wedding. Free Gifts – Register with great brands and receive a free gift! Guest Notification – Tell your friends and family the good news! Convenient Shopping – Create, update and shop your registry in store and online. Easy Returns & Exchanges – Change your mind? Bring it back for any reason, anytime! Exclusive Benefits of My Account – Enjoy access to exclusive benefits. TheKnot.com Partnership – Share your Kohl’s wedding registry with friends and family on TheKnot.com. Macy’s Wedding Registry has a TON of perks. You don’t want to miss these. GIVE A GIFT, GET A GIFT throughout the year when guests shop your list, they will get $20 off their next $50 purchase–spread the word! REGISTRY STAR REWARDS the rewards go to…you! score 10% Rewards† on eligible items you buy & 5% Rewards† on eligible gifts you’re given. GIFTS WITH COMPLETION get special gifts†† when you complete your registry with some of our favorite brands. I hope these choices help you narrow down where you want to register for your wedding and take one stress off your mind while you are planning for you big day!